Do I Need Headphones for Music Production? How Do Dynamic Headphones Work? What Goes Into Making the Best Headphones for Music Production? A good pair of headphones can be a key part to any producer’s gear collection. Headphones are very useful in music production during the mixing and mastering stages. They can provide the listener with a second reference to compliment a pair of studio monitors. They are can also be useful to vocalists and instrumentalists during recording. In this review, we’ll go over how dynamic (moving-coil) headphones work, their advantages and specific applications, and finally cover the best headphones for music production in 2019. After a good amount of research, reviews, and a personal purchase, I recommend a pair of Sony MDR-7506s. The Sony MDR-7506s win top spot on this list of 10 best headphones for music production. These are used in studios worldwide for a multitude of tasks and come at a very reasonable price. If you’re looking for a solid pair of headphones with a proven track record and reputation as the industry standard, these are your choice. The HD 800S from Sennheiser is a heavy-hitter in the audiophile world, and wins 2nd place in our list. 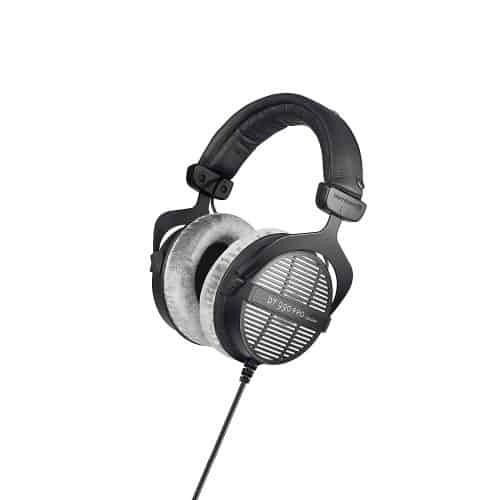 This open-back pair of headphones feature massive 56 mm drivers, the largest on the market at the time this article was published. They also feature balanced cables for the cleanest signal and pristine audio reproduction. If you want one of the best and are willing to pay for it, these are for you. Don’t forget an amp! The DT 990 Pros from Beyerdynamic win 3rd place on our list because they offer great value for their price. They offer phenomenal audio reproduction and stereo imaging, and were built with longevity and the listener’s comfort in mind. They are also made in Germany and held to strict QA/QC guidelines standards. Don’t forget an amp! In order to understand what makes a pair of studio headphones great for music production, we first need to understand the specific problems that they solve, their advantages, and how they work. Let’s get educated. Room and desk space can be precious. They can provide a second reference without taking up as much additional real estate as a second pair of monitors. Very low noise when mixing – your neighbors will love you for this. Stereo imaging is limited with closed headphones. Not advised for an entire mix – headphones should be used mainly to reference something made with studio monitors! Dynamic or moving-coil headphones are just a pair of electrostatic transducers, so basically small speakers that are mounted to your ears! Like speakers, they convert an electrical signal into sound. Each side contains a permanent magnet mounted to the frame. A coil of wires called the voice coil is suspended in the magnet’s magnetic field by a diaphragm. The as the electrical signal is passed through the coil, it creates an induced magnetic field that reacts with the permanent magnetic field to move the diaphragm. The movement displaces air and creates sound. Headphone design has many factors and variables that need to be considered when making a purchase. Below is a list of some of these factors and a description of what they are. Padding material should be comfortable, durable, and easy and inexpensive to replace. Padding thickness should be thick enough to create an acoustic barrier between the listeners ears and the surrounding environment. Cable conductors should be balanced and shielded from radio-frequency radiation. This prevents any electromagnetic interference from distorting the sound. Conductors should also be made of copper. 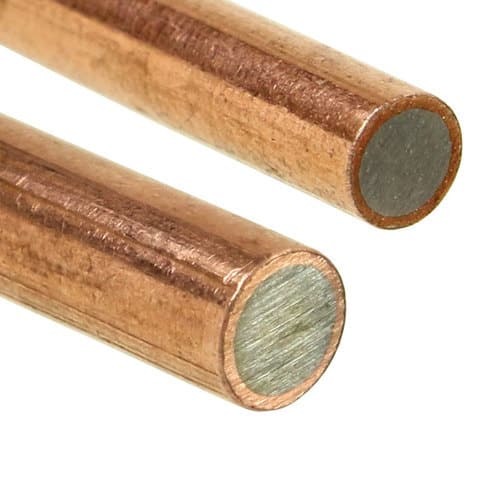 Oxygen-free copper (OFC) is more of a marketing gimmick than anything, and doesn’t significantly effect conductance, so therefore it isn’t necessary. Connectors should be designed to eliminate and minimize stress at the interface between the connector and cable conductor. Connectors should ideally be gold or silver-nickel alloy plated to prevent corrosion that may impede the signal. 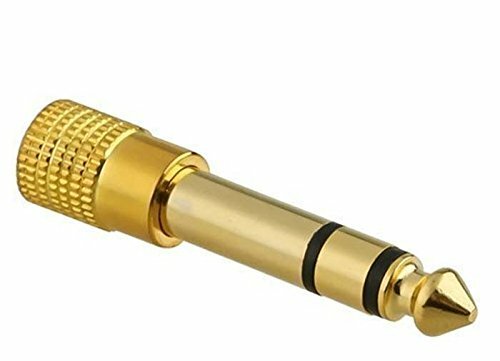 Gold-plated 1/8″ to 1/4″ threaded TRS adapter that comes standard with many a pair of headphones. The headband should be some type of strong metal, usually stainless steel, that will resist breaking under high stress when the wearer bends and contorts it. The headband should be lightly padded and covered with leather or some type of durable synthetic material. Frames should be made of a strong and lightweight material such as anodized aluminum or high-strength plastic. Frames should also be sufficiently thick so that they will not crack when dropped. The magnets are very important because they provide the magnetic field that interacts with the voice coil. We want magnets with a high strength-to-weight ratio that will not lose their field strength over time. For this application, the best headphones for music production will use rare-earth magnets like neodymium or samarium-cobalt. 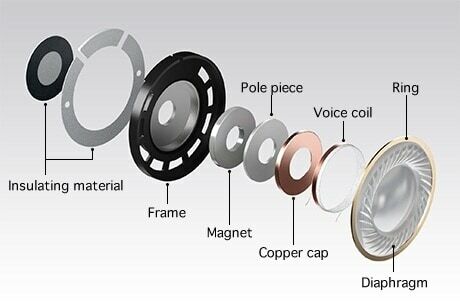 Weight reduction is very important when it comes to voice coil design. Lighter weight means more precise movement, and that in turn translates to better and more accurate sound. One way to reduce weight is by using CCAW (copper-clad aluminum wire) for the voice coil conductor. Aluminum weighs significantly less than copper. Another weight reduction design choice is the use of thinner wires. This, however, will require more windings, which increases the impedance and may end up requiring an amplifier. Electrical impedance is the resistance to current flow in an electrical circuit. Usually the higher the impedance, the better the sound reproduction quality. This is because high impedance is usually a result of weight reduction in the voice coil. Considerations need to be made for amplification when purchasing a high-impedance pair of music production headphones. Ideally, we want our music production headphones to have a completely flat frequency response. This means that the audio signal coming in should be reproduced with as little change in gain across the frequency spectrum as possible. Frequency response is very important because it tells us how the headphones will color the sound. We want our headphones to eliminate as much outside noise as possible. Noise isolation will be dependent on padding material, thickness and fitment. Shrillness and harshness, especially at higher frequencies, coupled with long periods of listening can cause whats called listener fatigue. Headphones with an exaggerated treble response can limit the amount of continuous time that they can be used. Breatheability and comfort is also another consideration. Most higher-end headphones are built with comfort in mind. As a general rule, you get what you pay for when it comes to comfort. These are the more subjective items to consider when purchasing a pair of headphones for music production. You’ll need to think about each one and the situations you’ll be in while using your headphones to make a choice that is right for you and your specific needs. Size – How big is is your head? Foldability – Will you be carrying them from place to place, or mostly using them in a stationary studio? Cable length – Will your connection point be far from you when you use them? Amped or not amped – Depending on the impedance, you may or may not need to buy a separate amplifier for your music production headphones. This in turn will effect overall price of your purchase. Price – What can you afford? What level of quality are you willing to pay for? These factors along with the prices were all accounted for while formulating this list of the best headphones for music production in 2019. Without further ado, let’s take a look. 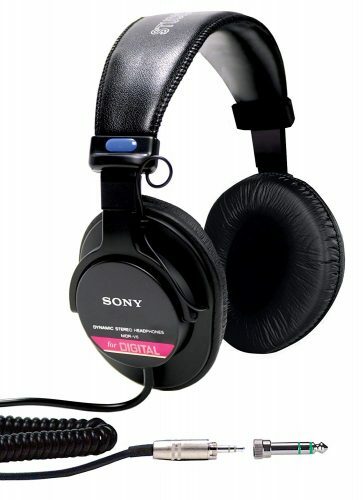 The Sony MDR-7506 is a great choice for headphones geared towards music production, and at a very reasonable price. They contain neodymium rare-earth magnets, have a long cord that stretches to nearly 10 ft, and can be adapted to and from 1/8″ TRS to 1/4″ TRS with a threaded gold-plated adapter. Construction materials are decent, but not the greatest and may not stand up to rough use. Bass response is slightly exaggerated, with mids and low treble being mostly flat. There is a peak at around 10 kHz, which can make vocal sibilance stand out a bit. They are good at isolating treble sounds, but lack in mid and bass noise isolation. They are moderately sized and will fit people with smaller heads. 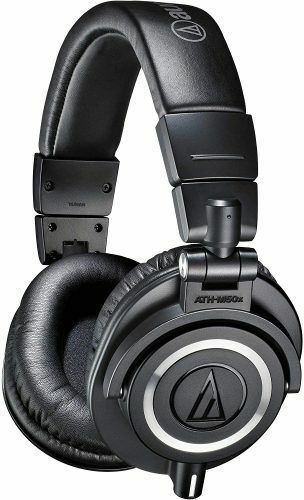 The Audio-Technica ATH-M30x is like the little brother to the M50x we’ll cover later. This pair has smaller drivers and a smaller frequency response range. 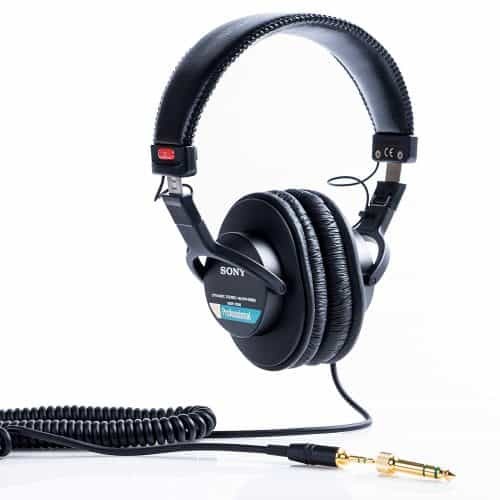 Like most of the others on this list, these headphones have a 10 ft coiled cable with 1/8″ TRS connector that can be adapted to 1/4″ with the included gold-plated adapter. Building materials are decent but nothing special. 47 Ω impedance is low enough so you won’t need an amp. Frequency-wise, bass and mids response is great, being almost completely flat. Unfortunately,they fall short in the treble range. There is a very noticeable dip at about 5 kHz. This will really effect how your vocals sound on these headphones. All of this being said, the ATH-M30x is considerable less expensive pair of headphones than some on this list. The Sennheiser HD 280 Pros are perfect for those on a budget, with price comparable to the Sony MDR-7506s we covered above. They have a long coiled cord that stretches to nearly 10 ft, and the connector can be adapted to and from 1/8″ TRS to 1/4″ TRS with a threaded gold-plated adapter. Construction materials are mediocre at best, which may be reflected in the price. Much of the parts such as the padding can be replaced if they wear out, however. These headphones are low-impedance and will not require amplification. Low-bass response is moderately exaggerated, and high-bass has a small dip at at around 190 Hz. Mids are overall mostly flat, with low-mids being slightly overemphasized. Low-treble is lacking slightly, but overall treble response is evenly balanced. These headphones are bulkier than normal but do fold making them less-than-ideal for portability, but it’s still doable. The Sony MDR-V6 are a step up from the MDR-7506 mentioned earlier. These have an extended frequency response range, use copper clad-aluminum for their voice coil wiring, and oxygen-free copper in the cable. They are also foldable, have a smaller frame, and are great for on-the-go musicians and producers alike. Bass response from about 40 Hz to roughly 150 Hz is flat but well above zero, adding to an exaggerated low-end much like the MDR-7506. There is a slight peak between 400 – 500 Hz, but other than that, mid-range is flat. On the high end of the spectrum, there is a pronounced cut at 6 kHz with may take away from vocal sibilance. A large peak is also present at roughly 10 kHz. 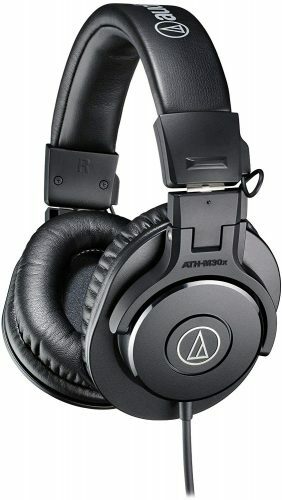 The ATH-M50x headphones from Audio-Technica are seen by many mix engineers as top-notch. These come with three detatchable cords in varying lengths. All connectors are gold-plated for enhanced corrosion resistance.The ATH-M50x have an extended frequency response and large 45 mm drivers for a full spectrum of sound. Construction materials are high-quality and built to last. The bass response is mostly flat, with a slight increase in high-bass. Mids and high-mids are mostly flat. Treble response varies moderately with frequency. There are peaks at 5 kHz and 10 kHz which can add considerably to sibilance and brighten things up a bit. These headphones are relatively big and well suited for people with larger heads. 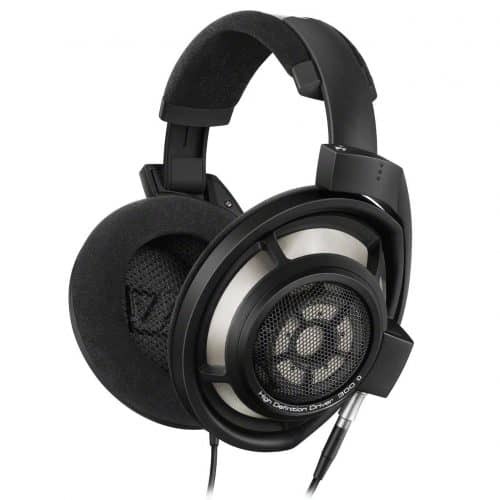 The 250 Ω version of the Beyerdynamic DT 770 Pro is a formidable set of headphones geared towards professional studio use. They contain neodymium rare-earth magnets, have a long coiled cord that stretches to nearly 10 ft, and can be adapted to and from 1/8″ TRS to 1/4″ TRS with a threaded gold-plated adapter. Construction materials are high-quality with a big emphasis on comfort. 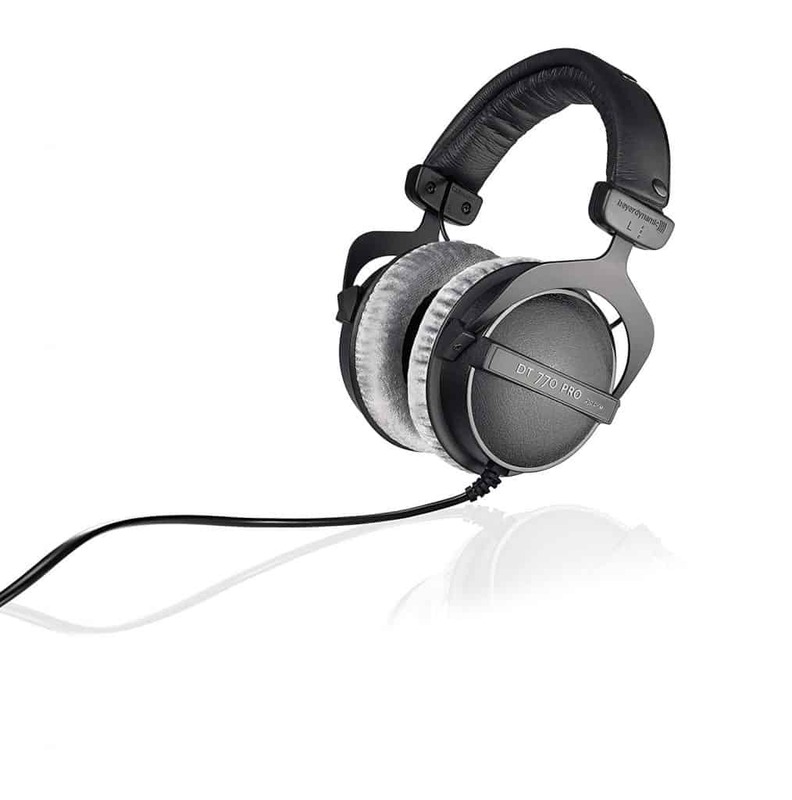 The DT 770 Pro also boasts similar pulse characteristics to high-end electrostatic headphones. 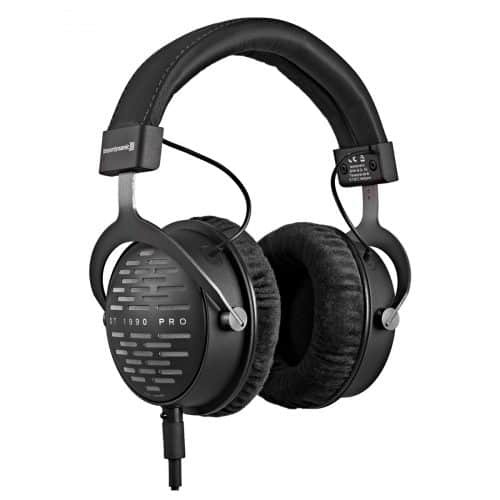 These headphones will require amplification due to their high 250 Ω impedance. Bass and mids are overall very flat, with low-bass reaching all the way down to 5 Hz. Treble response is somewhat erratic, with a peak at around 9 kHz and a dip at around 3.4 kHz. They are bulkier than normal and less suited for mobility and portability. The 250 Ω version of the Beyerdynamic DT 990 Pro is nearly identical to the 770s above, with the only real difference being their open-back design. They contain neodymium rare-earth magnets, have a long coiled cord that stretches to nearly 10 ft, and can be adapted to and from 1/8″ TRS to 1/4″ TRS with a threaded gold-plated adapter. Like the 770s, construction materials are high-quality with a big emphasis on comfort. These headphones will require amplification due to their high 250 Ω impedance. Bass and mids are overall very flat, with low-bass reaching all the way down to 5 Hz. Treble response is somewhat erratic, is overall very balanced. They are bulkier than normal and less suited for mobility and portability. Their open design give them a considerable advantage over the 770s in the stereo imaging department. 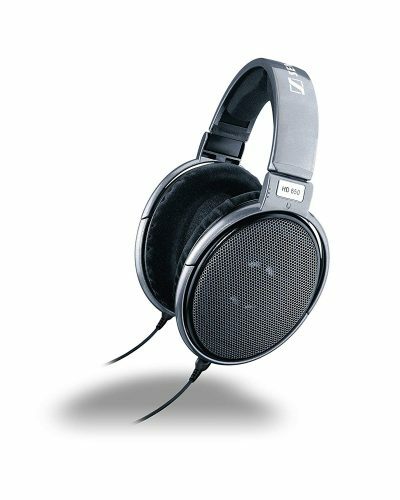 The Sennheiser HD 650s are wonderful mid-high end headphones for music production. These have a 300 Ω impedance and will require an amp. They come with a detachable OFC cable that is designed to have very low handling noise, eliminating inaccuracies that may stem from movement in the cable. They also come with a 2-year warranty. Bass response is very good overall, but low-bass is lacking slightly which may be noticeable in tracks with big bass presence. Mid response is almost perfectly flat, and low- to mid- treble are mostly flat. High-treble begins to taper off a bit at around 5 kHz, which will effect primarily vocals and drum overheads. The DT 1990 Pro from Beyerdynamic is up there with the HD 800 S mentioned next in terms of build quality, response, and comfort, but come at a more moderate price. They come with a single sided, detachable XLR cable with mini-XLR connectors. Like many of the others on this list, the ear pads are replaceable. This pair comes with two sets of ear pads, with differing sound characteristics. Bass response is very flat with a slight increase in high-bass/low-mids. Mid-range is also mostly flat, with a slight dip at around 1 kHz. Treble is flat up to roughly 5 kHz. Higher than that, there are two pronounced peaks at 7 kHz and 9 kHz and an overall bump between 6 kHz – 10 kHz. This can make instruments or vocals in this range sound overly bright. 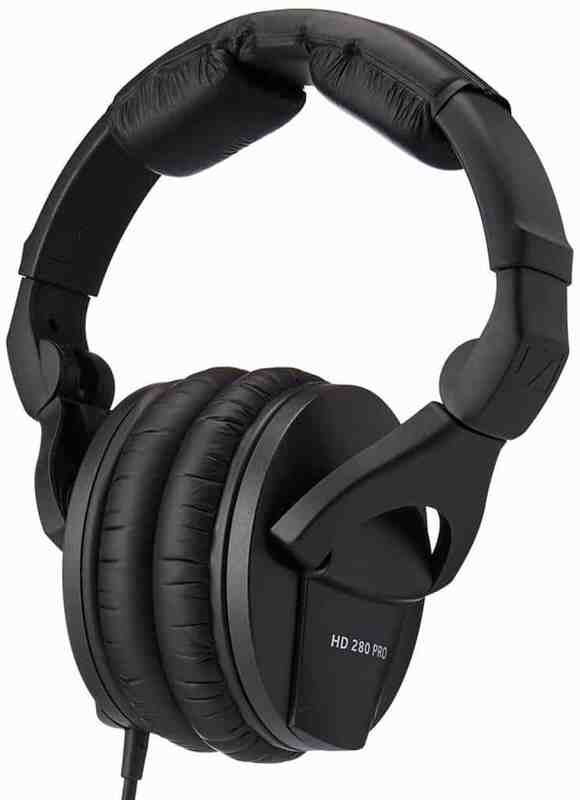 Stereo imaging and soundstage on these headphones is very good due to their open-back design. These, like the HD 800 S, also posses very little harmonic distortion. This pair of Sennies may possibly be best headphones for music production on this list in terms of build quality, response, and comfort, but it comes at a very steep price and will require an amp. These are only feasibly suitable for very high-end studios and audio applications. They come with a detachable OFC cable that is designed to have very low handling noise, eliminating inaccuracies. They also come with a 2-year warranty. Bass response is very good overall, but low-bass is lacking slightly which may be noticeable in tracks with prominent bass presence. Mid response is almost perfectly flat. Treble is mostly flat and overall capable of great audio reproduction. Stereo imaging and soundstage on these headphones is also phenomenal, and they have very little harmonic distortion. Open-back for those of you in a VERY quiet environment such as an acoustically treated studio – remember, noise can pass freely through the headphone frames. These are not suitable for recording, since the mic will pick up feedback from the headphones. Closed-back for general studio use and those of us without acoustic treatment who are in noisier environments. These are better for vocalists to wear when recording because they create an acoustic barrier between the drivers and the mic. That wraps it up for this review. Thank you for reading, and I hope this list helps you make a great choice for your music production headphone purchase!